Although this is only the second movies project I have put together, I am noticing a trend. There is one film from each that garners the biggest “how have you not seen this?! ?” reaction. With last year’s project, hands down it was Back to the Future. 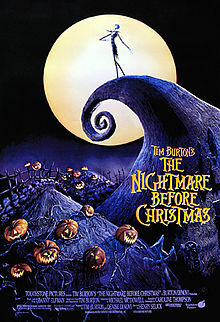 This year it’s Tim Burton’s The Nightmare Before Christmas (with apologies to Rocky and The Bourne Identity). 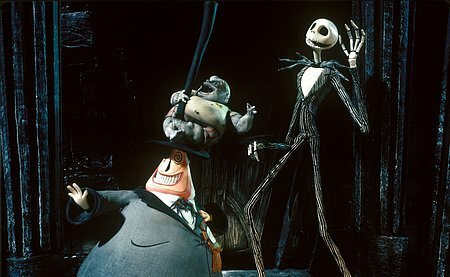 Set in the spookily morbid world of Halloween Town, the film follows the plight of one Jack Skellington, a thin skeleton who wears a snazzy black pin-striped suit. Every year the monsters and mutants that make up the town’s population rely on Jack to lead their Halloween celebrations. This year, however, Jack has become disillusioned with their proceedings. While wandering about, he stumbles upon a portal into a new world — Christmas Town — and becomes enchanted with what he sees there. Seeking to bring that Christmas spirit into his hometown, Jack decides he wants to be Santa Claus and hires a group of residents to kidnap the jolly fat man. Clearly this is a bad idea, but it sets the precedence for some of the film’s greatest moments. As a trio of kids — dubbed Lock, Shock and Barrel — chase down Santa, a ridiculously inappropriate (but wildly amusing) song starts playing that discusses how they want to “chop Santa into bits.” I don’t know how appropriate that is for children, but I got a kick out of it. It was also a lot of fun watching Jack masquerade as Santa Claus, delivering frightful gifts to little kids. Outside of these comical bits, however, I felt little attachment to the film. 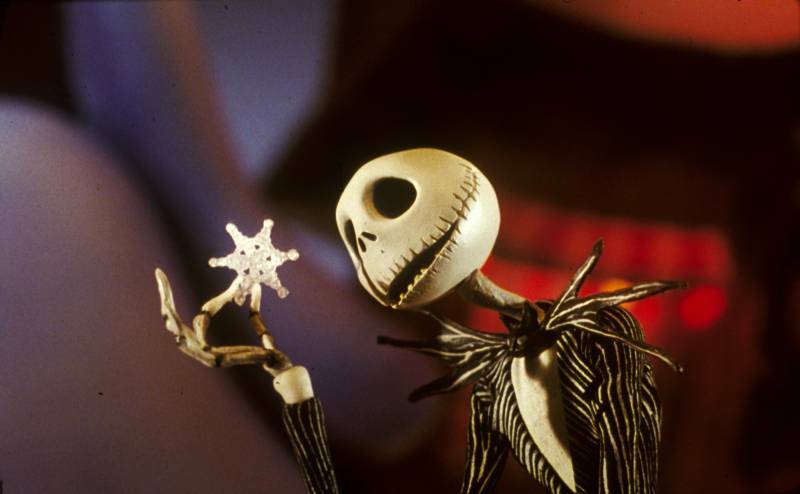 Most of Danny Elfman’s musical numbers, outside of the opening tune, are forgettable, and the film’s emotional development rests its weight on the skinny little shoulders of Jack Skellington. Most of the supporting characters fall flat, and I did not feel connected to any of them. On the flip side, I did find it amazing that Burton’s stop-motion animation still holds up remarkably well nearly 20 years later. I can’t use the word “beautiful” because of the grotesque subject matter, but this is one slick-looking film. The character designs are especially imaginative, and there’s always something new to catch the eye. I can’t help but feel that a lot of The Nightmare Before Christmas‘ appeal rides heavily on nostalgia from those who saw it in their youth. It’s a solid film, but is it truly worthy of its near-unanimous praise (IMDB Top 250, 96% on Rotten Tomatoes)? I like this one and prefer it over Tim Burton’s more recent films. I never fully got into his films but this one is one of my favorites by him. Nice review. Thanks, man. I haven’t seen a lot of Burton’s recent work — just Charlie and the Chocolate Factory and Alice in Wonderland, I believe — but it sounds like he has been on a slippery slope lately. Heh, I know you aren’t going to be alone on that, Fogs. For me, aesthetics can only carry a film so far, and this film just didn’t have much substance. A seven is still a good score from me, but I didn’t fall in love with this like so many others. Nice write up Eric but I’m in Fogs’ camp with this one, I really like this! I just love how twisted it is and offers the perfect alternative to the usual Christmas stuff. Thanks man. I definitely dug the macabre art style — there just wasn’t much else I found too appealing. 7/10 is about right for this. It’s good, but it’s not anything special. Cool, glad I’m not alone then. It seems we are in the minority on this one. Great review! This is one of my favourite Tim Burton films! Its great festive fun! Thanks, Paul. Not one of my favorites from Burton, but it’s a fitting one to watch during the holidays. I really wanted to like this film, just all those songs made it too Disney for my taste, and I gave up half way through. I suppose I wasn’t the right audience. Well, to be fair, this was originally a Disney movie. They decided to release it under the Touchstone name since it was “too scary for kids.” But yeah, I can see what you mean. Disney movies aren’t really my thing either, but I thought I would give this one a fair chance. This is uncanny! My hubby & I actually watched parts of it last night (yes AFTER Christmas, ahah) but we haven’t finished it yet. Somehow we got too tired, we still have a bit of jet lag going on. I didn’t realize it was a musical though, we thought it’d be like the Corpse Bride. Hmm, I haven’t seen Corpse Bride, but yeah this is a non-stop musical. 😀 Will you be writing about it when you finish it? Curious if you end up liking it more than I did. It’s actually a far more decent film than you may think, but only the first entry. As for Nightmare Before Christmas I couldn’t agree with you more. It’s a good film, but not worthy of the overpraise that it has received from the public. I do think a good part of it comes from the visuals and how original the subject matter was at the time, especially when it comes to animated films. Remember that Disney had just released Aladdin when this came out. So it was probably a chock to see something so dissimilar make it to the multiplex. Yeah, that’s a great point about Nightmare. It was quite a bit different than what audiences expected at the time, and it certainly made it stand out from other animated films. The visuals are still great, but I don’t think the film overall holds up that well. I saw this when it was first released—but I went because of my years of affection for Oingo Boingo. I remember thinking the animation was cool (and still holds up well, so my kids say), the plot/premise okay, but for me it boiled down to an entertaining, long-form Danny Elfman music video. And it remains a total winner, in that regard. Side issue: I never imagined the film to be a prominent presence in the Disney universe, but visiting Disneyland last year I was amazed at the overwhelming prevalence of Nightmare in terms of child-friendly souvenirs. At home, teens think their Jack Skellington t-shirts are “goth/alternative,” but I realized during my visit to the Haunted Mansion that it’s all just a superbly well-managed Disney brand—colossally popular while still feeling “unique.” I tip my hat to the marketing team. Hmm, never thought of it being an extended music video, but yeah, it does kind of play out that way. Nice comparison. Regarding your side note, yeah, it’s funny that Disney has now taken the Nightmare concept and ran with it. In the 90s, they deemed it “too dark and scary for kids,” but they ended up rebranding it under their name, even going so far as to re-release it in 3D in 2006. Now Nightmare products are everywhere.